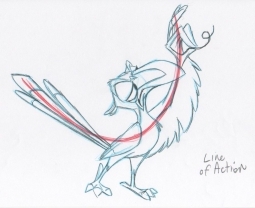 For “The Lion King“, I was promoted to Directing Animator for Zazu, the hornbill major domo to King Mufasa. 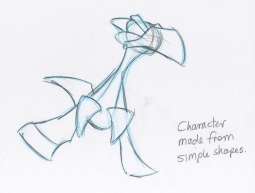 My role as Directing Animator was to contribute designs for the model, research the animal and personality, define the character through movement and figure out how he talks with a beak, animate most of the footage myself, and supervise a crew of 2 animators. 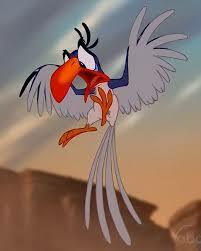 I was responsible for the consistent look and acting/action of Zazu — a dream come true and so much fun! 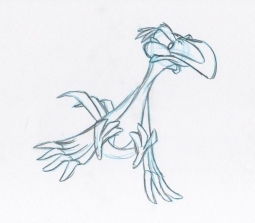 Check out my hand-drawn animation clip of Zazu (@ 0:01 sec) on my Animation Theater Page. 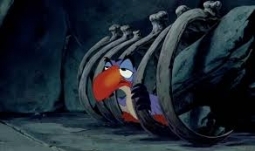 My experience with Zazu was the first time I could really “stretch my wings” at Disney. 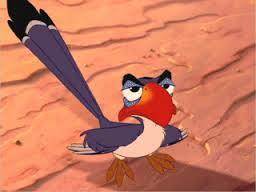 I learned volumes about confidence, creativity, and leadership from animating Zazu. 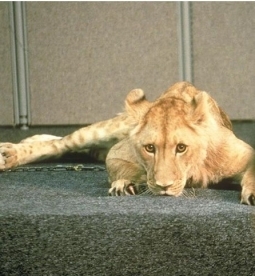 I worked with wonderfully talented artists on “The Lion King”, and learned so much from them as well. All of this translates to stone sculpture and stone sculpting. And in both the business and creative realms. I should write a book about that experience . . .
Zazu talks a lot, and dialog is really fun to animate! Before Zazu, I animated a lot of pantomime characters which is also fun, but they don’t talk much. “A Matter of Opinion” is my stone sculpture of two zebras having a conversation. I used all my knowledge of poses to communicate feelings in sculpting these two “characters”.